Is May the New December? I’ve noticed a pattern over the past several years, especially since I started substitute teaching: the school year speeds up exponentially after spring break. It’s like a race to the end of the year, to fit in all the end-of-year projects and parties and field trips. Everyone, especially the children, can feel that summer break is fast approaching, and life takes on a frenetic pace. Maybe that’s why I’ve heard more than one person complain that May is the new December, as if December is a bad month. I quietly took issue with this notion. My favorite time of year is Advent, preparing for the birth of the Christ child. I love the Christmas music, Christmas shopping, wrapping Christmas presents at night while watching Christmas movies, doing the Advent calendar with my kids, and – yes – my seasonal socks. Yet for many people it’s a nightmare of obligations and deadlines and buying presents for people they don’t really like. I get it – December can be stressful. Not to mention that if you’re in college, you have exams, while all you can think about is the long break that’s so close you can almost touch it. I can certainly commiserate because I was a December college graduate. And that year, while I thought it would be such a relief to finally be done with school forever-and-ever-amen, I found myself immersed in not only editing but also typesetting the second volume of Fiction Fix when our previous typesetter bailed. People were counting on me, and I wasn’t able to enjoy December – or even being done with college – like I’d expected. Maybe this is how my friends feel this month. For me this year, May is more than teacher’s gifts and good-byes and summer planning. I took the Florida Teacher Certification Examination this past Monday, which meant cramming for almost two weeks. As soon as I got through with that, I took on the end-of-year books for my first grader’s class. 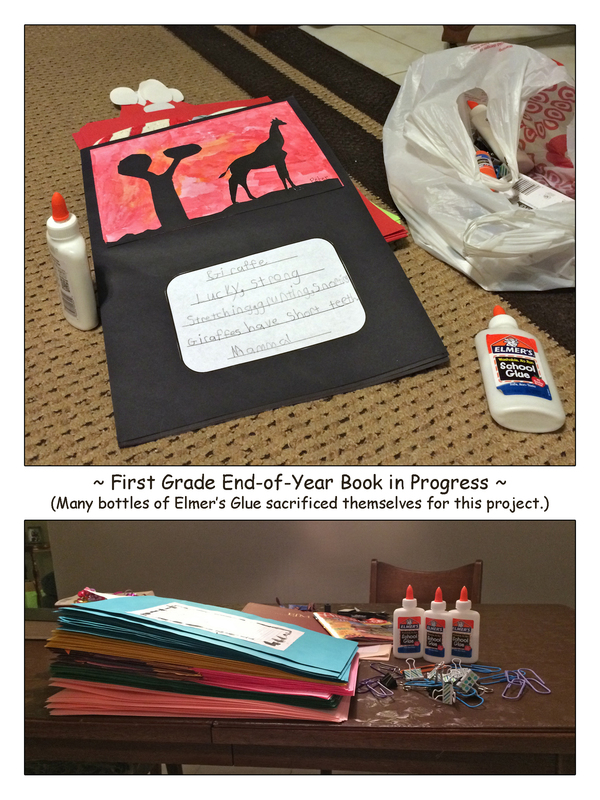 These books hold the kids’ projects from August through the end of the year – over 20 pages of 12×18 construction paper – but what I didn’t realize was that about half of these projects still had to be glued to the paper before the books could be assembled. Another mom and I thought we could knock it out on Tuesday, only to find out we were in way over our heads. I’ve taken pages home every night, still have five or six to go, and need to finish by Tuesday. So my May has been busy. I’ve put off the usual things that fill up my to-do list, things that are still waiting for my attention, and I can feel them getting ready to pile back on. Like two freelance projects that I hope to finish in the next month, before our family vacation. Like a friend’s novel that I’ve been slowly beta reading since January. Like my own fiction projects, which I blogged about as recently as last week. But I’ve been living with a kind of giddy feeling, anticipating the (temporary, at least) cessation of certain obligations. This weekend alone, three culminated: yesterday was my son’s last baseball game of the season; this morning was the last Sunday school class I have to teach until September; and this afternoon was my community chorale’s last concert of our spring season. Not to mention that this week will be the last meeting of my third-year Education for Ministry group (which means I’m almost finished with the 1000+-page history book we’ve been discussing since last fall). After Memorial Day weekend, my son has a partial week of school, and then first grade will be over. What this means is that, even though we have school for a few more days, when we’re home for the evening, we’re home. I’ll have time to cook and actually enjoy supper. By the end of the month, I won’t have to wake up at 4:30 for a blessed two-and-a-half months. This doesn’t mean that I’m just going to sit around and twiddle my thumbs all summer – the kids and I will be plenty busy – but it does mean that I will be able to stop and breathe for a minute. I love summers because I get a break. I’m grateful for this because so many parents aren’t able to have the time off with their kids. But if I’m not careful, I can allow myself to dread the end of summer break. I have to remind myself that I always love the beginning of a new school year, and I have ever since I was a kid. This year, my little guy will start preschool, so it’s going to be even more exciting. As my kids grow, everything seems to speed up, and I have to be careful not to stress too much over all the activities and responsibilities that go with being a mom-slash-chauffeur. What I do, I do for them and for us as a family. School and tutoring and daily chores are part of our life, but if we begin to allow the fun stuff – the baseball and the play dates and the trips to the park – become obligations instead of fun, it will be time to reassess. I don’t ever want to let a particular month turn into a time of dread, and I hope everyone else embroiled in the busyness of these times will do the same. This entry was posted in Odds and Ends and tagged Busyness, End-of-Year, Fiction Fix, Goals, Obligations, Parenting, School, Stress, Writing. I’m looking forward to summer, too, but mine won’t start until I survive the Florida Folk Festival. Then I can join you in breathing a little easier. Enjoy your summer break.